This is a process of wearing ear electrodes that submit a unique wave form, comparable to normal cellular electrical output, to influence the increased production of alpha brain waves. This leads to more regulated cellular electrical output leading to an increase in neurotransmitters such as serotonin to create a normalization in the brain. The Alpha-Stim 100 treats anxiety, depression, and/or insomnia with microcurrent using a method called cranial electrotherapy stimulation (CES). The treatment is very simple. The current is applied by easy to use clip electrodes that attach on the ear lobes. Used just 20 to 40 minutes every day, every other day, or on an as-needed basis, it can help induce a pleasant, relaxed feeling of well being. The Alpha-Stim 100 is well tolerated and very safe in contrast to drugs used in the treatment of mood disorders, many of which have been proven to have undesirable side effects and can be addictive. Unlike drugs, the Alpha-Stim 100 leaves the mind alert. Anxiety reduction is usually experienced during treatment. Depression and insomnia control is generally experienced after one to two weeks of daily treatment. CES can also help treat the underlying mood disorders associated with pain. 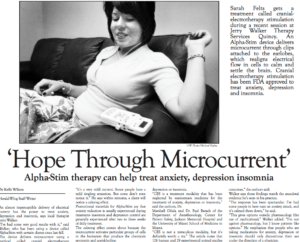 Alpha-Stim has been in double blind studies comparing performance to antidepressants. It proved to show more positive results in placebo effect studies in treating depression and anxiety than Zoloft, Prozac, Paxil, and Effexor.